Undoubtedly, historic Fort Kochi is the best area to stay in when visiting Kochi, one of the must see tourist destinations in Kerala. Not only is this area very atmospheric, it's home to the majority of Kochi's attractions. Many heritage buildings have been turned into accommodations that have become a real hit with travelers. These boutique hotels and homestays in Fort Kochi are among the most popular ones. Do note that the prices listed don't include tax. However, most of the places provide free wireless Internet, which is handy. Something to keep in mind is that alcohol is highly regulated by the government in Kerala. You'll find that very few restaurants, including hotel restaurants, have licenses to serve alcohol in Kochi. Luxury hotels are an exception. Beer is often provided "under the table" though, if you ask. Wondering what to do in Kochi? Take a look at these Top 10 Kochi Attractions and Top Kochi Tours on Tripadvisor that you can easily book online. The CGH Earth group specializes in eco-friendly luxury and unforgettable experiences. This remarkable CGH Earth property has been created from the remnants of a Victorian shipbuilding yard and has 22 rooms. It's situated on the waterfront, in between the Ferry Terminal and Chinese Fishing Nets in Fort Kochi, and offers views to die for. The hotel's Armory Bar serves alcohol. Cost: From around 8,000 rupees per night, depending on the time of year. 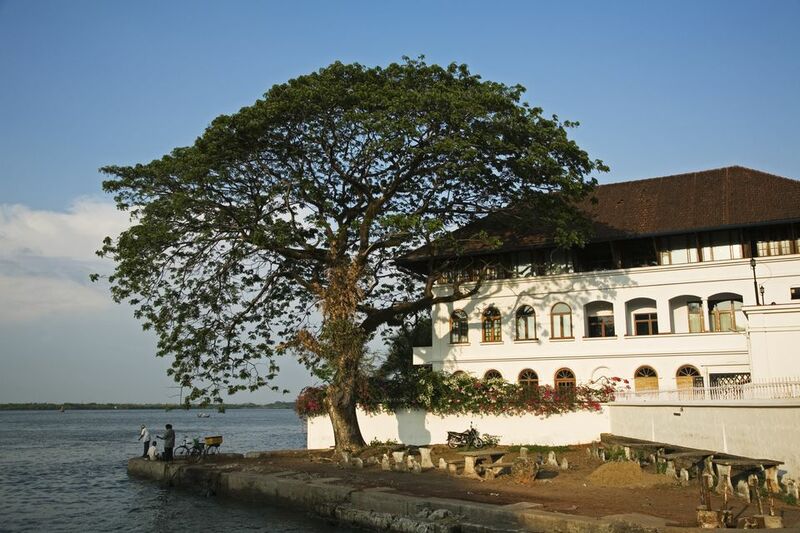 The gloriously restored Old Harbour Hotel is perhaps the most popular luxury heritage hotel in Fort Kochi, and it's located just around the corner from Princess Street. A 300 year old Dutch-style building, it has 13 rooms (each named after an old street in Fort Cochin) and Kerala garden cottages. The rooms have high ceilings and either look out onto the courtyard or Chinese Fishing Nets nearby. The cottages have open-air showers and verandas. Other facilities include an Ayurvedic spa, swimming pool, and restaurant that serves alcohol. Guests are also given organic soap. Cost: About 9,500 rupees per night upwards. If you'd prefer contemporary luxury rathern than heritage luxury, Fragrant Nature will appeal. This boutique hotel opened in 2015, in the old East India Company building overlooking the waterfront near the Ferry Terminal. It has its own landmark clock tower, and 41 rooms spread over three categories. It's the largest 5-star hotel in Fort Kochi. The hotel chain has a focus on wellness. Meals are prepared using organic ingredients, and yoga and Ayurvedic spa treatments are offered. Notably, the hotel's East India Street Café is the first 24 hour cafe in Fort Kochi, and the hotel lobby features works by two of the best Trompe L'Oeil artists from the United Kingdom. Cost: From around 7,000 rupees per night. Another CGH Earth hotel, the boutique Eighth Bastion is relatively new (it opened in 2012), and blends colonial and contemporary architecture. It has 19 guest rooms, and a hip and elegant feel to it. The hotel was inspired by the area's Dutch past, particularly the crumbling remains of Fort Immanuel. There's evidence that the Fort had an eighth bastion (as opposed to the standard seven) where the hotel now stands, hence its name. The hotel has a swimming pool and restaurant that serves fusion food, plus a central location in Fort Kochi less than 10 minutes walk from Princess Street. Cost: From around 6,500 rupees per night. The Secret Garden is a luxurious boutique heritage hotel that's a cozy home away from home. There are nine guest rooms in this 100 year old ancestral property. All have canopied beds, and some have day beds with magnificent traditional Indian murals painted on them. Facilities include a wide selection of movies and music, books, bicycles, a swimming pool, and yoga sessions every morning under the mango tree in the back garden. Plus, the hotel is eco-friendly, with rainwater harvesting and solar water heating. Its hidden away about 15 minutes walk to Princess Street and the Chinese Fishing Nets, near the Indo-Portuguese Museum. Cost: 7,000 rupees per night for double room and 9,000 rupees for a suite. The Tea Bungalow is a heritage home, built in 1912, with plenty of old-world charm. It used to belong to a tea company, which is how it got its name. It offers 10 beautifully furnished rooms, each associated with a port involved in spice and tea trading. There's a serene garden, swimming pool, guest lounge with library, and multi-cuisine restaurant as well. The hotel's quiet location in Fort Kochi is approximately 10 minutes walk from attractions such as the Chinese Fishing Nets and Princess Street. Cost: 5,500 rupees per night upwards. The Fort House is a delightful family-run hotel with 16 rooms and a quiet waterfront location not far from the Ferry Terminal. It's about 10 minutes walk to the Chinese Fishing Nets. One of the really appealing things about this hotel is its lush garden setting, decorated with terracotta lamps and statues. Its restaurant, right on the pier, is another highlight. An Ayurvedic center on the premises and no televisions in the rooms make this hotel the perfect place to relax! You can also wander across the road to the cultural center, where there's a museum, gallery, and Kathakali performances. Feel like a drink? There's a restaurant next door that serves alcohol. Cost: Around 4,500 rupees per night upwards. Tissa's Inn is a boutique hotel, housed in an historical mansion in central Fort Kochi, with nine guest rooms. It's owned by and named after two brothers who are renowned antique dealers -- and its tasteful decor is evidence of this. The hotel's slogan, "We Believe in the Good Life", is supported by a restaurant that specializes in fresh seafood, rooftop swimming pool, and yoga and mediation area. The rooms vary in size and quality, with the standard ones being compact and devoid of attractive outlooks. Cost: Depends greatly on the time of year. Rates are heavily discounted during summer and the monsoon season. Expect to pay around 4,500 rupees per night upwards. This artsy little hotel, nestled in the heart of Fort Kochi, is a recently remodeled 17th century Portuguese house. It has seven super-stylish rooms, some with garden views, plus basic rooms with fans for budget travelers. The hotel's name means "destiny" in Sanskrit, and the owner has aimed to create a soulful space for guests to enjoy. The design was inspired by Chicago-based artist William Jerard, and the architecture features exposed brickwork and refurbished wood. There's also a rooftop to sit out on and a Zen rock garden. Cost: From 500 rupees per night for a basic room with private bathroom and fan, up to 2,000 rupees per night for a deluxe king suite. These rates are the lowest rates available on booking engines during the off-season, and they're a steal! The deluxe king suite is usually 5,000 rupees per night. The convenient central location of this heritage hotel, right on Princess Street (Fort Kochi's main tourist strip), makes up for its hit-and-miss customer service and superficial shabbiness. The rooms are set around a courtyard, as the hotel's name suggests. They're spacious and decorated with glorious old furniture such as four-poster beds. Guests can dine under the mango tree in the courtyard. The hotel's history is interesting too. It was once the home of an eminent Jewish lady but was abandoned in the 1990s after she died. A couple who wanted to start a hotel subsequently purchased and transformed it. Cost: Expect to pay about 2,500 rupees per night upwards. The Fort Bungalow is an immaculate new homestay that opened up in early 2015. There are 11 large guest rooms, spread over three floors of a beautifully renovated heritage building with central atrium courtyard. It has an eclectic and vibrant feel, with bursts of color, yet is also very calm. The friendly hosts are a wealth of knowledge, and happily give travel tips and assist with arrangements. This place really stands out in terms of service, cleanliness, and ambiance! The location, less than 10 minutes walk to Princess Street, is great too. Cost: 2,700 rupees per night upwards. Sajhome is possibly the most popular homestay in Fort Kochi, which is not surprising as the hospitality is superb. It's located next door to Tissa's Inn, and has six very comfortable guest rooms with small private balconies. The food is delicious, and the host is an expert in taking care of travel arrangements. Nothing is too much trouble for him. Bicycle hire is even available at the homestay! Cost: From around 2,500 rupees per night. Heavenly Homestay is everything that a homestay in India should be. The hosts (a husband and wife, with young daughters) go out of their way to make sure guests' needs are taken care of. The rooms are spacious, clean, and air-conditioned. Plus, there's a lovely garden to relax in. The property is located in a quiet residential neighborhood in Fort Kochi (near the Secret Garden hotel). It's a little further out than some other accommodations but is still only a 15 minute walk to Princess Street and the main attractions. Cost: 2,600 rupees per night upwards, including a huge home cooked Kerala style breakfast. Be sure to book well in advance. If you'd like the benefits of a homestay but are concerned about maintaining your privacy, Bastian Homestay is ideal. The guest rooms are situated in a new building separate from the host's house (although just opposite it). The homestay is sweet and simple, and close to all attractions in Fort Kochi. A wide range of cuisine is served including traditional Keralan dishes. Cost: From 700 rupees per night for a budget double with fan. Expect to pay 1,200 rupees for an air-conditioned double. All rooms have modern private bathrooms. Breakfast is additional and costs 100 rupees per person. If you're on a tight budget, Good Karma Inn is perhaps the best place to stay in Fort Kochi. It has six clean and simply furnished guest rooms, all with private bathrooms. The staff is very helpful, and the location is peaceful yet only 10 minutes walk from the Chinese Fishing Nets and Princess Street. Understandably, this place is very popular with backpackers and young travelers! Cost: From 600 rupees per night for a non air-conditioned economy double.